The last night of the fall, the winter solstice, is celebrated in the Iranian culture. It occurs on December 21 or 22. In Iran this night is called Shab-e Yalda (Yalda Night or Shab-e Chelleh), which refers to the rebirth of the sun. 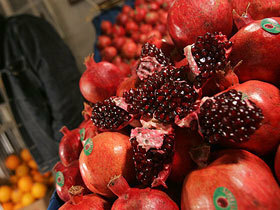 Yalda is the longest night of the year. Ancient Iranians believed that at the end of this longest night, which they believed was evil, darkness was defeated by light (Sun) allowing the days to become longer. This celebration comes at the beginning of the Iranian month of Dey. The birth of the sun and beginning of the winter has become the beginning of the year and source of celebration in many cultures and traditions. Early Christians related this very ancient Persian celebration to Mithra, goddess of light, and linked it to Christ’s birthday. Today, the date for Christmas is slightly off from Yalda, but they are celebrated in many similar ways, staying up all night, gathering with family and friends, lighting candles, and eating special foods. The ancient Iranians kept the fire burning all night to ensure the defeat of the forces of Ahriman (devil). There would be feasts, acts of charity and a number of deities were honored to ensure the total victory of Sun essential for the protection of winter crops. With the conquest of Islam, the religious significance of ancient Persian ceremonies was lost. However, ceremonies that upheld the spirit of Islamic teachings continued to win favor.